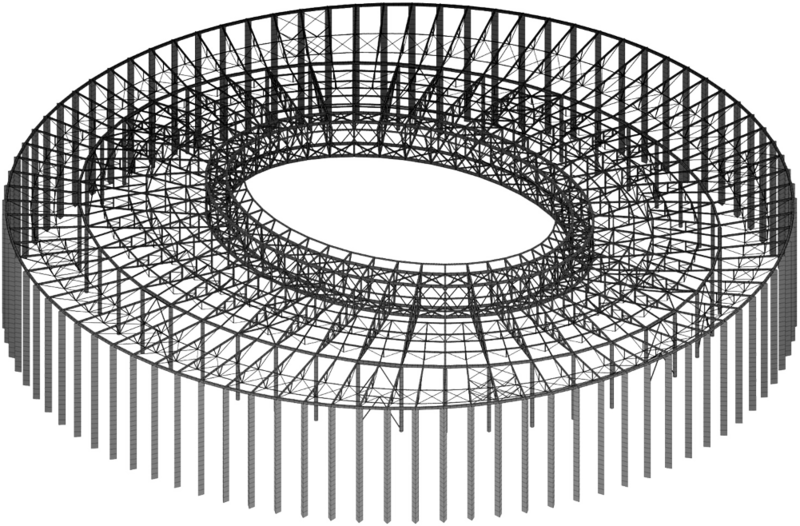 With almost 10,000 tons even before the polycarbonate cladding is laid, the roof of Stadion Nizhny Novgorod will be among the most impressive out of all 2018 World Cup venues. We've already hinted on Facebook and Twitter that we really enjoy how this stadium is looking already, half a year before planned delivery. But there's much more than aesthetics worth mentioning here. First of all, its overall surface is expected to reach 56,700 m2, which makes it one of the largest of its kind worldwide. That even without a retractable part or running track, both of which could increase the roof's scale considerably. The reason for its immense surface is the outer perimeter. The roof spans well beyond the 45,000-seat stands, covering the promenade around them as well. 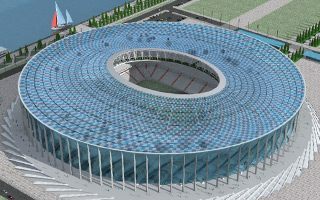 With a circular footprint, the stadium has a diameter of 287.6 meters! Even before placing any cladding, the roof already weighs some 9,884 tons! Most of that mass is generated by the 132 concrete pylons (88 of the outer ring and 44 of the inner one), however the steel central ring above what will be the football field is also very impressive in size. As we speak installation of the polycarbonate roof cladding is ongoing. Three colours were chosen: white, light and dark blue. This way a vortex-resembling pattern will be created, symbolically in line with the rest of the stadium, inspired by water and wind.